CAQ AG will be presenting its sophisticated quality and product management solutions at the MEDTEC Europe trade fair from the 4th to the 6th of April 2017 in Stuttgart, Germany. Come visit us at stand 3D14 in hall 3 and find out more. We have always been aware that the producers and suppliers of medical technology must adhere to the strict rules and regulations of the European Medical Device Directive and the US Food and Drug Administration (FDA). That is why we integrated and consistently maintain powerful functions and up-to-date guidelines in our software in order to assist you in all matters relating to quality management in the area of medical technology. 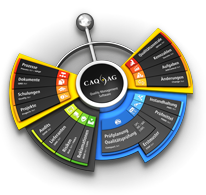 It therefore comes as no surprise that, for over thirty years, many medical technology companies have put their trust in the software solutions of CAQ AG Factory Systems in order to fulfil FDA-associated framework conditions and successfully master stringent quality management and validation processes. Visit us at the MEDTEC in Stuttgart and find out how our software solutions can assist you in virtually all quality-related aspects of the medical technology sector. You can secure your free entry ticket to the MEDTEC 2017 right here.